And yes, this postcard was marked using MS Paint – using a touchpad! On a netbook! 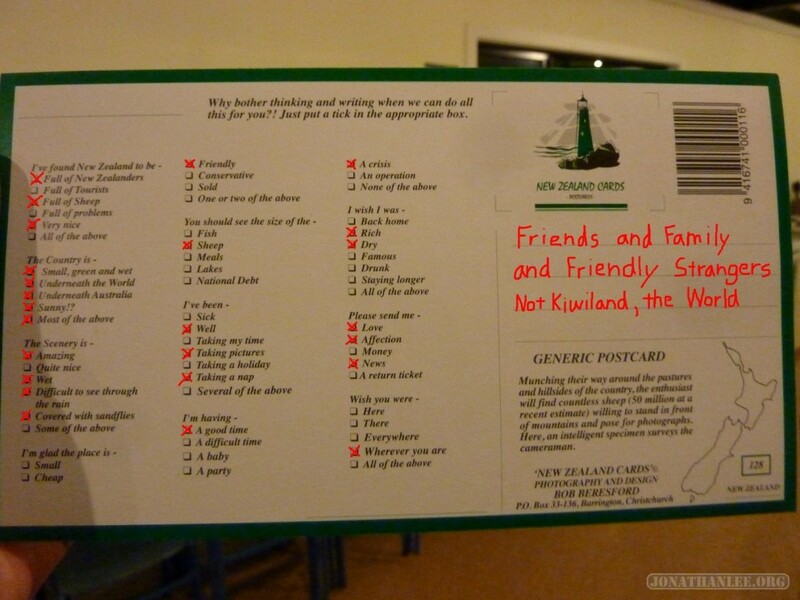 It’s a touchpad-marked postcard, sent from New Zealand with Love. 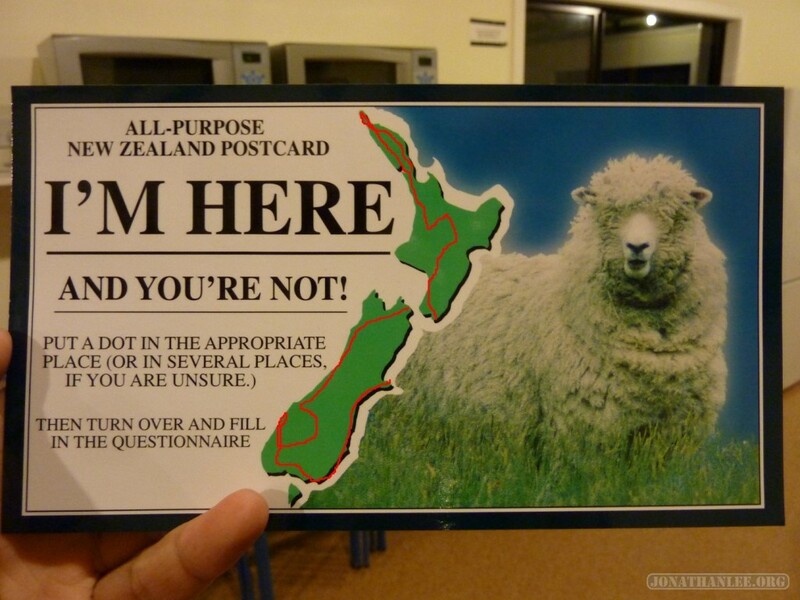 On a side note, this is the world’s most awesome postcard – even if you don’t know what to write, the postcard has already figured it out for you! Plus, it is hilarious. If I could, I’d buy the equivalent for every single country I visit. So happy to see you and your travelogue; interesting encounteres and great photos! Grandma and grandpa saw it too and loved it. Joyce is getting ready to go to VCU Art. Kevin came back last week, had lunch with grandma and grandpa. I did not get to see him this time. Ben had a very good crew season, won almost every Occoquan Regatta, and won the State Championship-Gold. Mike and I chaperoned his team to Stotesbury Regatta and National Championship Regatta, 3 days each, in 2 consecutive weekends. So busy, just now got time to sit down to talk to you. Ben had his 17th Birthday with 3 of his friends yesterday. We went to Wolftrap to see the Memorial Day Concert and Firework, good weather, great show, and everyone enjoyed the gathering. Chase, Jenny, Carina and Jenny’s mom is visiting this weekend. Carina matured more and is very sweet. All is well here. Wish you a safe and fun journey. Keep the logue coming, I bookmarked it. It’s the personal touch that makes it extra special. In case you think you’re cool traveling the world seeing beautiful and exotic people and places, I think you should know, Linda and I just bought a juicer. Where is your stop? You know, i might be taking vacation in July, so just in case we might miss seeing each other. Anyhow, safe journey and all the best!! Keep on surviving buddy! Drink an extra drink, eat an additional bite of mutton, and take more steps for us who can’t be there. Oh and lots of pictures. You missing out on all the table-5 related gatherings we’ve been having. While I am not out roaming NYC, I continue to focus on building a virtual world of hacks.